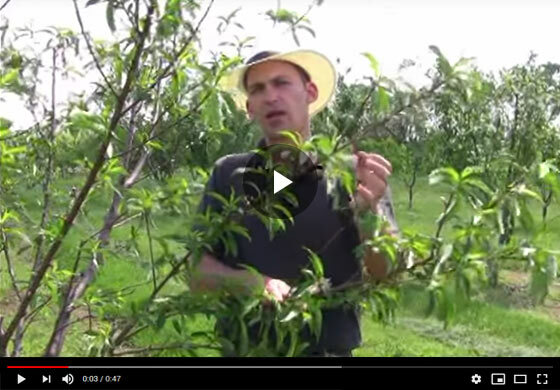 Join Felix from Gurney's Seed and Nursery as he demonstrates how proper thinning can help you grow bigger fruit on your tree. Hi everyone, Felix here at Gurney's and I just want to give a couple more tips on fruit thinning. When you have a really heavy crop and you get all this fruit set, and you can see this branch right in front of me is loaded with peaches that are just developing and we're thinning this tree. I know it's difficult for your folks when you have a nice crop load, to take the fruit off your tree. But the benefits are huge and I'd like to show them to you here today. When you think about a peach, a really nice big piece, it's going to weigh between a quarter and a half pound and as many fruit as we have on this little, pencil thick helper branch here, there's just no way that it can support that load. So the only way to succeed is too thin that fruit off this limb down to one per four inches or so, and that will help your tree stay intact and a quick way to deal with it. If you look at this branch here, we have a lot of fruit on it. If we counted there are about 30 fruits that we would like to leave on it and that's 15 pounds of fruit load, and it's just too much and one quick way you can actually thin your tree is to take out some limbs, some over growing limbs that are going to shade your fruit, you can actually take the whole branch out like we're going to do here. Just take this whole branch out, now this small, one inch caliper branch has a lot less fruit load on it, It won't break on us later and we avoided having to hand thin a lot of that branch.